This is obviously a good thing, especially if you can use as your reference point a day on a Scottish mountain. 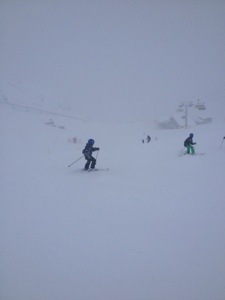 Even the windiest lift-shutting blizzard in the alps pales into insignificance against the raging hurricane that is a normal day at Glen Shee. All those pomas and t-bars seem immune to wind, perhaps that’s why they have so many of them in Scotland and not just to test the endurance of your thigh muscles. We had a couple of white-out blizzard days. The only reference points for the vertical were the piste markers, and the other skiers (well the few that were still upright). At one point, while showing a lost skier back to her route, expert Swiss skier hubby somehow mistook the poles marking the left-hand-side of the run, for poles marking the right hand side and shot off into the deep snow that had settled in a wee burn. It’s not that often I get a chance for a hysteric belly-laugh as my husband wallows about in neck-deep snow searching for his skis. Had we been skiing in Scotland, this would be the best day out of the year: amazing snow conditions, wide slopes totally devoid of people, no lift queues, hardly any wind, and a total absence of rock and heather on the run. We felt like we were doing something real, an expedition, an adventure, something to be survived. It also means that you will get a seat at the über-cool Raclette Stube where you will be able to make full use of those floor-ceiling windows to observe your ski sticks blowing over and rolling away down the mountain. There will also be none of the usual hip-crowd there which means your shabby Gore-tex and bobble-hat will look less out of place. After all that, the tame, sunny, smooth perfect resort that returned the following day was almost a disappointment. I just can’t wait to get back to Glen Coe and test my rock and heather-avoidance skills. This entry was posted in Miscellaneous and tagged blizzard, Living with a Swiss, skiing, switzerland, white-out by nager. Bookmark the permalink.